Product #15487 | SKU 8010 | 0.0 (no ratings yet) Thanks for your rating! The black Genelec 8010 Bi-Amplified Active Monitor (Single) is designed for mixing and mastering in recording studios, broadcast facilities, and mobile work. The compact monitor utilises independent 25 W class-D amplifiers to power a 76.2 mm woofer and a 3/4" metal dome tweeter housed in a die-cast aluminium enclosure. 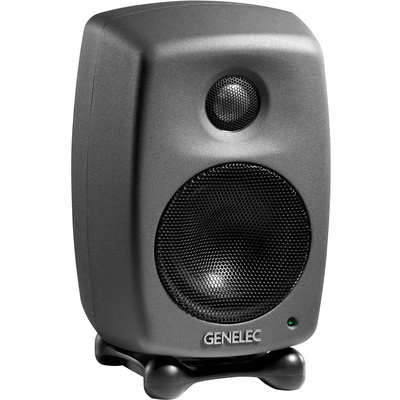 The monitor utilises Genelec's Directivity Control Waveguide and Minimum Diffraction Enclosure designs to tame box reflections, flatten the frequency response from 74 to 20,000 Hz, and provide a maximum SPL of 96 dB. The amplifiers utilise Genelec's Intelligent Signal Sensing circuitry to conserve electricity, utilising less than 0.5W in standby mode, 5W when idle, and 30W peak per amplifier at full output. The amplifier automatically detects the presence of an input signal and adjusts the power consumption of the monitor accordingly.